Abstract: Seismic waveform inversion is a powerful method used to quantify the elastic property of the subsurface. Although the development of seismic waveform inversion started in the early 1980s and was applied to solve scientific problems, it became popular in industry only about 15 years ago. One of the key elements in the success of seismic waveform inversion has been the increase of the acquisition of long offset seismic data from 3 km in the early 1990s to more than 15 km today. Not only did long offset data provide refraction arrivals, but it also allowed recording of wide-angle reflections, including critical angles, providing unique information about the subsurface geology. In this talk, I will elaborate on the early development of the seismic full waveform inversion (FWI) and its application to solve fundamental scientific problems. The first big success of FWI was its application to gas hydrate reflections, also known as bottom simulating reflection (BSR), which showed that the BSRs are mainly due the presence of a small amount of free methane gas, not a large amount of hydrates stored above the BSR, and hence the total amount of methane stored in marine sediments should be much less than previously estimated. A second major success of FWI was its application to quantify the characteristics of the axial melt lens observed beneath ocean spreading centers. The seismic full waveform inversion results show that one can distinguish between pure melt and partially molten mush within a 50 m thick melt lens, allowing to link the melt delivery from the mantle with the hydrothermal circulation on the seafloor. The application of full waveform inversion to spreading center problems has become an important area of research. Unlike in sedimentary environment, the seafloor in general scientific environment could be very rough and water depth could be deep, making it very difficult to use the conventional method of background velocity estimation. To address this issue, the surface seismic data could be downward continued to the seafloor, as if both streamer and sources were placed on the seafloor, similar to land geometry. This method allows to bring the refraction starting from zero offset to far offset, which is extremely useful for full waveform inversion of first arrivals. The downward continuation also allows to reduce the seafloor diffraction, increase the moveout of reflection arrivals, and enhance wide-angle reflections, all important for seismic full waveform inversion. The application of a combination of downward continuation and FWI has allowed to quantify gas anomalies in sedimentary basins and fluids at subduction fronts. The waveform inversion also has been used to monitor CO2 sequestration. In this talk, I will explain the intricacy of FWI, based on the physics of waves, specifically the role of amplitudes and converted waves in addressing fundamental scientific problems. The presentation should interest professionals working in the oil and gas sectors, or crustal studies and global seismology. 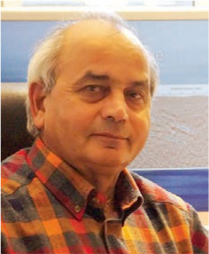 Biography: Dr. Satish Singh was born and raised in Varanasi, also known as Banaras, India and earned a PhD in theoretical seismology at the University of Toronto, Canada, including a year studying at the University of Cambridge, England. He joined the group of Professor Albert Tarantola at the Institut de Physique du Globe de Paris as a post-doc in 1988 and then moved to the University of Cambridge as a researcher in 1990 where he developed a group in theoretical seismology. Soon after arriving in Cambridge, Singh realized the importance of combining seismic reflection and refraction data and started developing new joint tomographic and full waveform inversion techniques. He also recognized the potential of these techniques in solving fundamental scientific problems and started applying them to gas hydrates, magma chambers, and crustal and lithospheric structures. He also recognized the importance of theory in seismic survey design, and implemented over/under streamer configuration to enhance frequency bandwidth for deep seismic imaging and ultra-long offset data recording for crustal studies. In 1997, he designed a combined 3D reflection and refraction experiment to study crustal structure at ocean spreading center. He led the establishment of the LITHOS Group to develop methods to jointly analyze seismic and marine electromagnetic data for subbasalt imaging in 1998. Soon after, he moved to the Institut de Physique du Globe de Paris to lead the creation of the Marine Geoscience Department that he ran until 2008, while keeping a part-time position at the University of Cambridge to maintain the LITHOS Group between the two institutions. After the 2004 great Andaman Sumatra earthquake and tsunami, he persuaded Schlumberger to fund the acquisition and processing of long offset seismic data offshore Sumatra in 2006 and later persuaded CGG to fund a similar experiment in 2009, deploying a 15 km long streamer, the longest ever deployed. In 2015, he partnered again with Schlumberger to acquire ultra-deep seismic reflection data across the Atlantic Ocean to image the base of the lithosphere down to 100 km depth. In 2012, he created the Paris Exploration Geophysics (GPX) Group, in collaboration with Les Mines ParisTech and other industry partners, and started an international master of research in exploration geophysics, a unique program in France.